WASHINGTON - To complement our revival of US electricity capacity reports, here’s a revival of our reports on US electricity generation. As with the fresh new capacity report, things are not looking too bright when it comes to electricity generation. There’s still a lot of grey — in the bar charts below, in the skies near fossil fuel power plants, and in the human and planetary outlook based on how slowly we are cutting fossil fuel electricity generation. As you can see in the charts above, wind and solar energy generation increased notably from the first half of 2017 to the first half of 2018. Together, generation from these two sources increased nearly 26,000 gigawatt-hours (GWh). However, hydroelectricity dropped considerably at the same time, by 12,000 GWh. In the net, US electricity from renewables grew approximately 14,000 GWh year over year. A large positive when it comes to the environment and human health is that coal generation dropped a great deal year over year — by even more than renewables increased. However, on the down side, natural gas soared as it became the #1 source of electricity generation in the United States (32% of US electricity). Furthermore, coal was still solidly in the #2 position (27% of US electricity). Renewables and nuclear were essentially in a tie at 19.8% of generation, with renewables just a tad above nuclear. 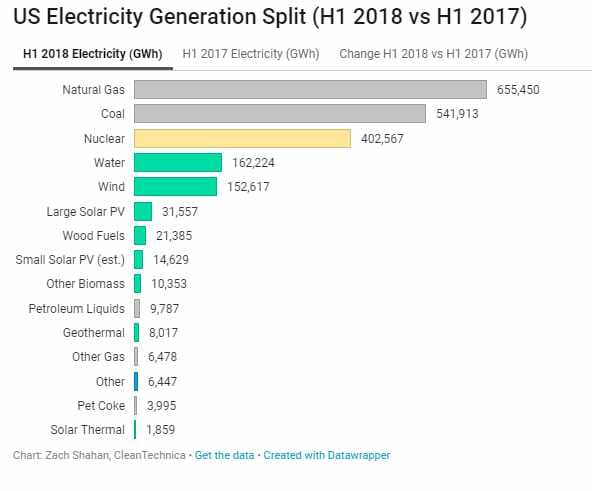 Actually, combined with an increase in nuclear power generation, natural gas electricity production increased so much that the renewable energy share of electricity generation actually dropped in the first half of 2018 versus the first half of 2017. It was 19.8% this year and 20% last year. Again, solar and wind saw a significant growth in its market share, from 9% to 9.9%, but hydro brought the whole category down due to a decrease from 9% to 8%. The visuals above are probably the best way to examine it all. The H1 2018 chart was still dominated by fossil fuels, which together accounted for approximately 60% of electricity generation. In H1 2017, the figure was 59.7%. Furthermore, if you switch to the “Change H1 2018 vs H1 2017 (GWh)” chart, you can watch a giant grey bar representing natural gas take over the top of the chart. It almost looks like it’s part of the border of the chart. The biggest glimmer of positivity in that chart is seeing the decline in coal at the bottom. What will the second half of the year bring? Well, the gigantic US electricity generation market shifts slowly. There is so much base capacity, and power plants last so long, that it takes a special kind of magic to create a rapid transition to renewable energy. As you know from reading this quarter’s US renewable energy capacity report, only 43% of new US power capacity in the first half of the year was from renewables. The majority of it was from natural gas. Along with other portions of the calculation, that means that electricity generation from natural gas is likely to increase more than electricity generation from renewables. Jump into the numbers below and let us know if you have any more thoughts.